Neuschwanstein Castle (Schloss Neuschwanstein) is without doubt one of the most visited German Castles. 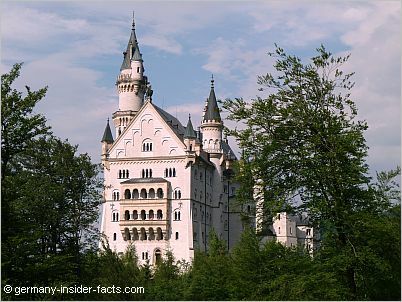 More than one million visitors travel to the fairy-tale palace in southern Bavaria every year. 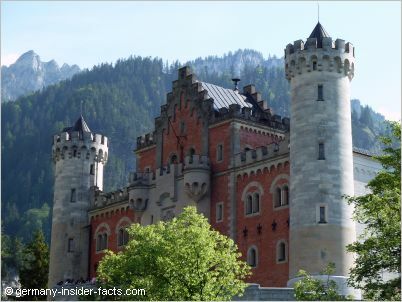 King Ludwig II of Bavaria, who is often attributed as the "mad", "eccentric", "swan" or "fairy-tale" king, had his dream palace built in Gothic Revival style on a rocky ridge not far from Hohenschwangau. 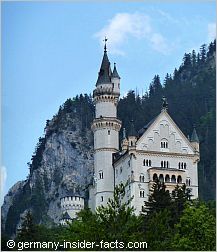 Neuschwanstein's dramatic setting on the ridge that borders the Pöllat Gorge in the west has indeed contributed to the castle's fairy-tale image. From whichever direction you look at the castle, you will be thrilled by its stunning location and its unusual architecture. No wonder that Neuschwanstein was the inspiration for Disneyland's Cinderella castle. Literally translated Neuschwanstein means "new swan stone". The swan was the heraldic animal of the counts of Schwangau, and it is the Christian symbol of purity. Originally called "Neue Burg Hohenschwangau", the castle was named Neuschwanstein after Ludwig's death. Ludwig II was fascinated and inspired by the medieval legends in Richard Wagner's operas: Tristan and Isolde, Sigurd, the swan knight Lohengrin, Parsifal and the minnesinger Tannhäuser. It is no surprise that paintings and murals in the rooms throughout the castle were modelled on these ancient myths & sagas which had also influenced Richard Wagner for his operas. 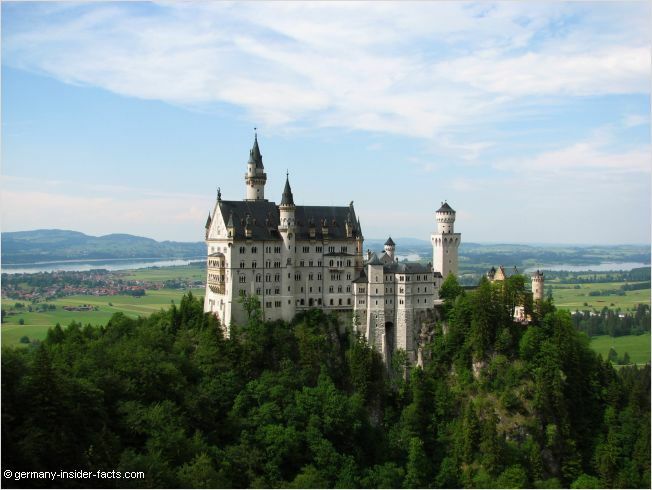 Since the Middle Ages two small castles sat on the rugged hill where Neuschwanstein stands today. Ludwig II knew and loved the two castle ruins since his childhood, after all, nearby Hohenschwangau castle was the summer residence of the royal family. Although it is said that the Wartburg was one of the models for Neuschwanstein, the final exterior design of the castle resembles more the second model, Chateau de Pierrefonds in France. The medieval castle ruins above Hohenschwangau were torn down in 1868, they couldn't be included in Ludwig's plan for his dream castle. September 5, 1869 - the foundation stone of the New Hohenschwangau Castle was laid. The new palace only got the name Neuschwanstein after Ludwig's death in 1886. At the end of 1873 the gatehouse, cased with red bricks, was finished and furnished, so Ludwig could live there during his visits to watch the further work on the castle. 1884 the king moved into the still unfinished palace building. It took two more years until the outside of the palas was nearly finished, the interior was never completed. At Ludwig's death on June 13, 1886 Schloss Neuschwanstein was far from complete. The irony is that Ludwig II planned his castle as a private refuge, but only seven weeks after his death Neuschwanstein was opened to the public. A 90m keep, the chapel and the Moorish hall were amongst the objects abondoned after Ludwig II passed away. Other structures were completed in a simplified form. 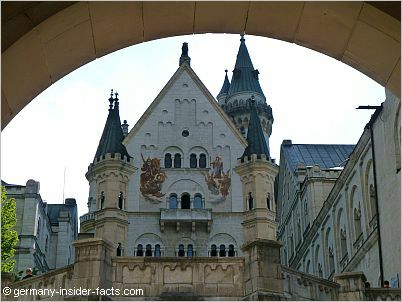 1918 Bavaria became a republic, and Neuschwanstein has been managed by the Bavarian Palace Department since then. Thanks to its secluded location, the palace was not destroyed during the second world war. During the Romantic Era in the early 19th century many castles in Germany were rebuilt romanticising medieval life (Burgenromantik). King Ludwig II of Bavaria was heavily influenced by Richard Wagner's operas about medieval sagas and knights. From an early age Ludwig escaped from the live filled with duties into his dream world of sagas and heroes. The young king wrote to Richard Wagner: "It is my intention to rebuild the old castle ruin of Hohenschwangau near the Pöllat Gorge in the authentic style of the old German knights' castles, and I must confess to you that I am looking forward very much to living there one day..."
The design was planned by Christian Jank, a stage designer. Architect of the project was Eduard Riedel. However, during the building period Ludwig rejected original plans, introduced new ideas and had so much control over the design that the result can be regarded as his design. The complex consists of several individual structures decorated with towers, turrets and sculptures. The castle stretches about 150m on top of the ridge. According to the plans, the palace at the western end of the castle should have more than 200 rooms. However, only 15 rooms and halls were completed. The singers hall is the largest room (27x10metres). It was one of Ludwig's favourite projects, inspired by the Sängersaal at Wartburg Castle. The Throne Hall with 20x12 metres is the 2nd largest room in the palace. Despite the medieval appearance of the castle, Ludwig included the latest technologies for the interior: an electric bell system, toilets with flushing water, hot air central heating and telephones. Ludwig's father Maximilian II had already admired the scenery around Hohenschwangau. 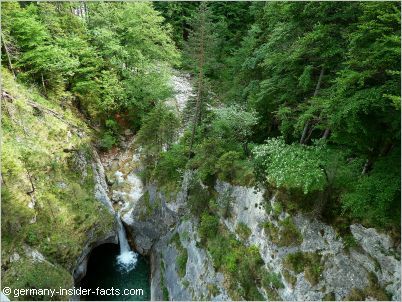 He had paths and lookout points built, as well as the "Marienbrücke" over the Pöllat Gorge which was present to his wife Marie. The ruins of the two medieval castles, located on the narrow mountain ridge called "Jugend", had been visited frequently by Crown Prince Ludwig when he stayed at Hohenschwangau. He loved the stunning views over the foothills of the Alps toward the lakes. This was the place to build his dream castle! For tips about tours or how to get there on your own, please visit the Neuschwanstein Tips page for more useful information. Now I hopefully made you long to visit Germany's fairy-tale castle? Here is more info to plan your trip!